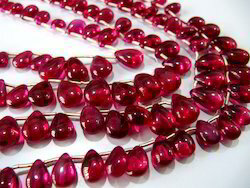 AAA Quality Ruby Smooth Flat Tear Drops 5x7mm to 10x14mm, Imitation Ruby Pear Shape beads, Lab Creaated Ruby Strand 8inch Long-30beads approx. Carved Beads are available in different sizes such as 3mm, 4mm, 6mm, 8mm, 10mm, 12mm, 14mm, 16mm, 18mm, 20mm etc and also in different shapes and colors. Our competency lies in manufacturing and supplying our clients an excellent quality range of Imitation Brass Beads.